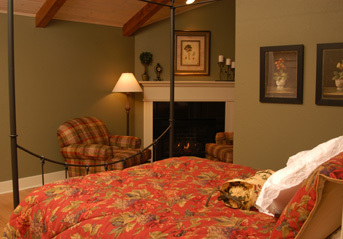 "I can't wait to stay at TimberCreek"
Our second most popular suite with a wrought iron queen bed, black marble fireplace, two reading chairs, a pickled wood cathedral ceiling, knotty alder beams, hardwood floors, and a private bathroom. Handicapped Accessible. 1st Floor. A nautical themed room with a brick fireplace, a pickled wood cathedral ceiling with knotty alder beams, a private bath, two large chairs for relaxing, peeled bark log beds (queen and bunk bed for sleeping 4), plant ledge, and nice lighting. 1st floor. Our smallest and least expensive Suite. 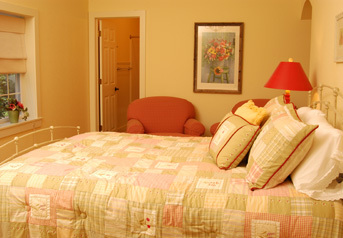 A cheery yellow room with pink accents, a 10' trey ceiling, crown trim, almond colored queen bed, flowery quilt, matching accessories, hardwood floors, two large chairs and a private bathroom. 1st Floor. 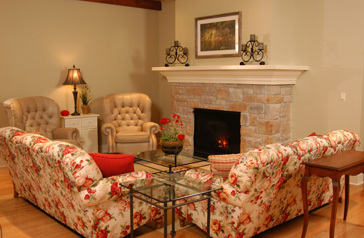 TimberCreek's most popular suite by far! 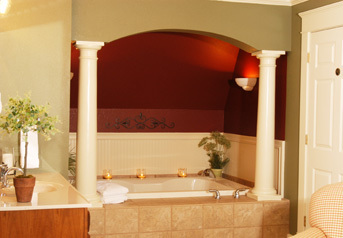 Our bridal suite has a 14' fireplace, Jacuzzi whirlpool, 2 person shower, cozy sitting area, columns, a mirror above a luxurious queen bed, hardwood floors, two large chairs, and a private bathroom. 2nd floor. The ultimate English Cottage Room. This Suite has a wonderful king bed, sitting area with a table and reading lamp, trey ceiling, crown trim, mauve-colored private bathroom, hardwood floors, and nice pictures. Wake up in Yorkshire, England. 2nd Floor. The perfect "Ladies Night Out" Suite. 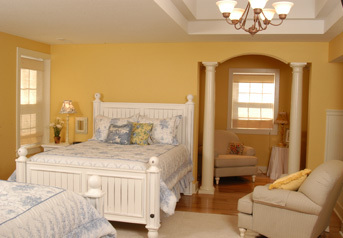 This room has bright yellow walls, 2 white queen beds with matching pillows, comforters, and nightstands, a blue denim couch/hide-a-bed, hardwood floors, private bathroom with skylight, upholstered bench, columns, and a double trey ceiling with chandelier. 2nd Floor. We also have a Cabin for a rustic overnight adventure. 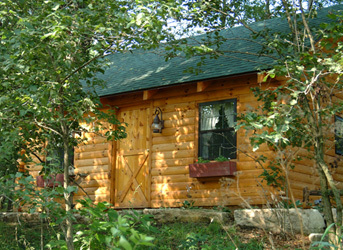 The Cabin is nestled on a knoll in a grove of trees at the top of a flight of stone steps. It has a full bed, two comfortable couches (one is a hide-a-bed), 2 rocking chairs, a kitchen table and six chairs, microwave, refrigerator, rustic light fixtures, rough sawed pine beams, and a loft with an air mattress. The Cabin restroom is the Rustic Outhouse below. (You must call to place a reservation. 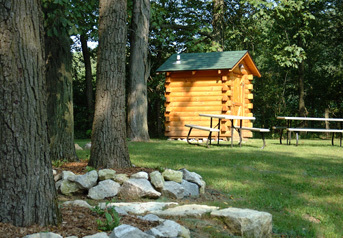 Online reservations are not accepted for the Cabin). Throw open the door of the Rustic Outhouse, and WOW, a normal working bathroom. In keeping with the bygone era, however, you'll need to face the day with only a sink, stool, and cold water. Karen (a lecturing guest) wrote "Thanks for a wonderful stay! Both the cabin and the suite were equally special--completely different, but charming just the same......." . 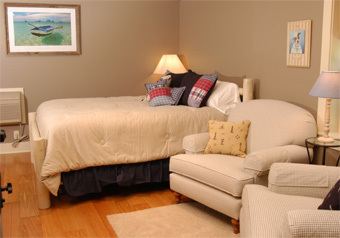 B & B Suites. No need to worry about other guests--you’ll have the whole premises to yourselves. 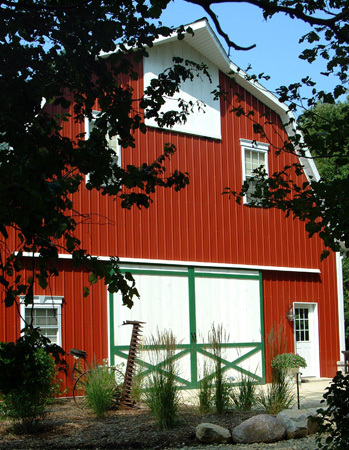 Meet your family and friends for Holidays, U of I games, Scrapbooking, Birthday Parties…… Price based on 12 people. 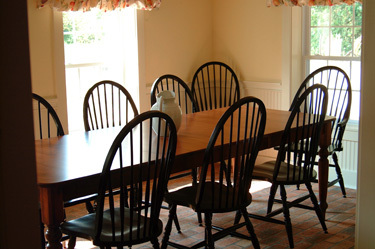 Reserve the Gathering Room and Breakfast Room for your business meeting, scrapbooking weekend, bridal shower, or church retreat between 9:30 AM and 4:30 PM. Catering is available. 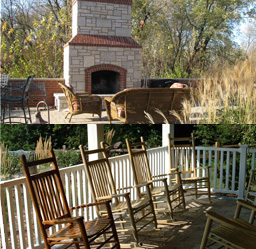 The outside covered porch and stone patio are also included, weather permitting. 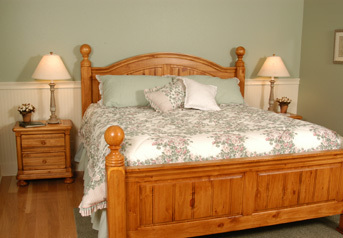 Rates are based on double occupancy per night. $10.00 additional for children 1 - 5. $20.00 additional for persons 6 and above. A bountiful breakfast is included each morning. A continental breakfast is served on Sunday morning. Check-in: 3:30. Checkout: 11:30. Please call if you plan on checking in later than 9:30PM . 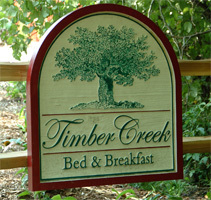 TimberCreek reserves the right to make accommodation adjustments to provide for your comfort. No Pets or Smoking inside the building. Because of our size, cancellations affect us significantly. Therefore we adhere to a strict cancellation policy. Cancelled reservations, regardless of the reason, are subject to a $25.00 cancellation fee, per room, per night. 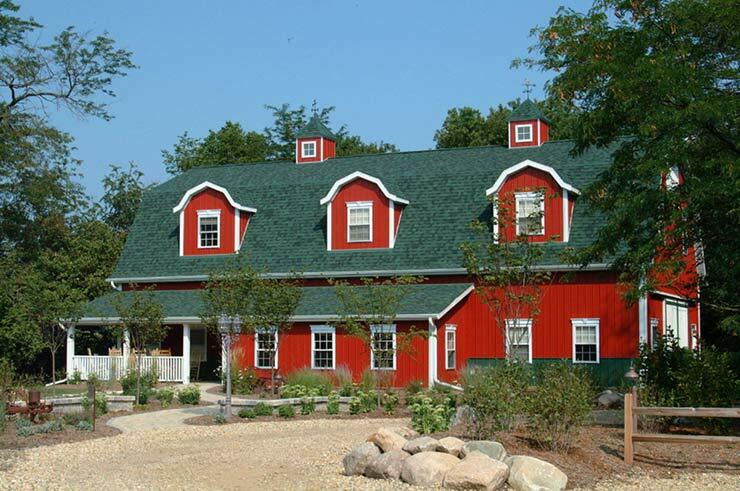 The balance of the reservation will be either forgiven or issued as a gift certificate based on the sole discretion of the owners of TimberCreek. The full reservation amount is charged at the time of booking. If you have any special needs, please let us know.